The first integrated stereo speaker and clock solution designed for the Amazon Echo Dot. 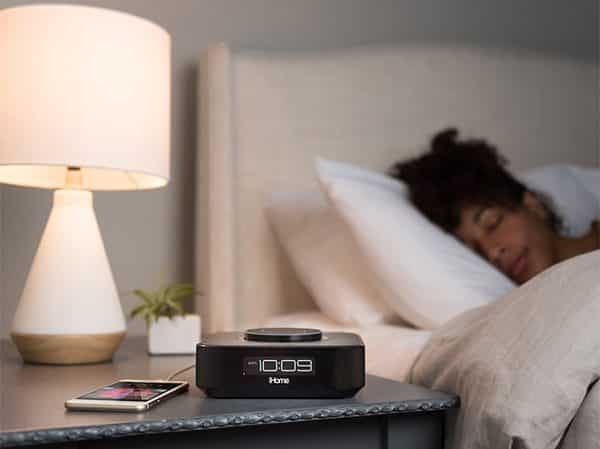 Enjoy room filling sound with your Amazon Echo Dot™ through this compact bedside clock speaker. Enjoy audio directly from your Amazon Echo Dot™ via the hardwired aux-in cable. Powers Amazon Echo Dot via included USB cable. Operates on included 100V-240V universal AC adapter. 2 AAA backup batteries for clock included. 1 Amp USB port to charge mobile devices. Gen 1 and Gen 2 docking insert included. • Let Alexa control your home from the bedside.